It is not often that you find a barbershop quartet made up of family members evolving into a multi-media entertainment entity. Heck, it's not often to find a barbershop quartet in itself, let alone the rest of the story. But the rest of the story is the one we are concerned with here. That barbershop quartet was the original Osmond Brothers who found their first real paying gig at Disneyland when they were all just boys. Well, just like the mouse that Walt turned into something much bigger, the Osmonds walked through the open door created by that first gig and built their own amusement ride...one that led to national TV and a musical legacy that continues some 40 years later. It was brothers Alan, Merrill, Wayne and Jay who started performing as the original quartet. They were soon picked up to sing on the Andy William's TV show, with Williams being one of their biggest fans. It was on these shows—at first the Christmas specials and then more and more show—where the siblings, who now included brother Donny Osmond, grew up in front of an entire nation, developing a following that soon rivaled that of Williams himself. This would continue for years with Donny and sister Marie eventually spinning off to become stars with their own careers. Youngest brother Jimmy Osmond had gone a different route, creating his own career as a solo artist, with great success in Japan. He also developed his own production company and produced several commercial and shows for TV. Jimmy became the driving force of the resurrected Osmond Brothers act, when in 1992, he along with his brothers, sans Donny, opened their Osmond Family Theater in Branson, Missouri, and began a run as one of that Ozark town's most successful acts. As they've gone from cute mini-men, singing and dancing in pint-sized tuxedos, to teen idols, fathers and family men and now, in some cases, grandfathers, they have never faltered on what they originally set out to do— build on a name that continues to stand for quality family-oriented entertainment. Sure, they have that built-in harmony as only brothers can have, and smiles that have probably made the family dentist very rich, but these guys have more than that—talent that hasn't dimmed in more than 40 years. They learned early on about professionalism—how to balance the business side while remembering their relationship as brothers; how to handle a crowd as well as the individual fan; how to be respectful of fans and how to survive in the precarious world of entertainment, which has always been shaky at best. Their tough exterior has gotten them through criticism for being too wholesome. The Osmond Brothers name still holds credence. 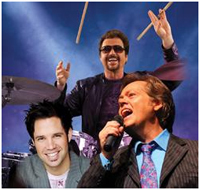 Jay, Jimmy and nephew David Osmond are the Osmonds coming to the Riverside Resort in an extension of their Branson show. JAY: David is our brother Alan’s son. He's a solo artist, and lead singer of The Osmonds 2nd Generation group. David also made it to "Hollywood Week" during Season 8 of "American Idol." He has done shows with us on the road and has also worked with us at times when we performed in Branson, Missouri. For all of our lives we have been used to juggling parts when someone was unable to perform. Now we juggle Osmonds! JAY: The Osmonds 2nd Generation has had several hits and several of them have recorded on their own. It is hard to know right now (if the Brothers will bring more of the next generation into their act) but it could be in our foreseeable future—at least now and then. People seem to like the fact that the Osmond name lives on, so we’ll just have to see. JAY: It is like a musical journey through time with the Osmonds. We perform our hits, and songs that have become our personal favorites over the years. The music business is so fragmented these days and people try to pigeon-hole us into one category, but it is impossible because we perform many different styles of music. The demographics of our audiences are so varied that our fans cross generations. JAY: The CD we are recording now contains brand new songs that we love and want the fans to hear. It is a new sound for the Osmonds and one that we feel the fans will love. We will put a couple of the songs in our upcoming shows. Hopefully the CD will be ready in time for our final tour in the UK, which begins in March. JAY: Growing up as an Osmond, there were both struggles and blessings. I’ve written a book about my life called “Stages – An Autobiography” in which I discuss a lot about my childhood. We’ve certainly had some interesting experiences. We made friends through our church and when we were able to attend public school on and off. JAY: We’ve always had conflict as normal families do, however, we had to learn to resolve those conflicts quickly because we work so closely together. Being able to do that has blessed our lives. The most enjoyable: the tours with screeching girls from England to L.A.; the weekly TV shows; the TV specials? JAY: All were enjoyable and each had its own challenges, but every one was a learning experience and a once in a lifetime moment. It was unique, interesting, fun, challenging, exciting, and hard—all at the same time. Which brother is the natural cut-up? JAY: Even though Wayne is the comic of our group on stage, Merrill actually is the cut-up. He can really be funny. JAY: That would be Wayne. JAY: Jimmy–he has the most flexible and unique voice of our group. JAY: We didn’t really know the magnitude that would follow, but as our mother always said, “Prepare yourself and the opportunities will come.” We prepared, and the opportunities did come our way! JAY: Yes, it was a crossroads and I did give it all up for a time. We got into country music because of our harmony background. I personally gave it all up in 1985 when I worked for BYU as an admissions counselor. Then in 1991, the Branson opportunity came along. It seems our career has gone by decades with each decade offering different opportunities for us to grow and expand. JAY: Contemporary rock is still my favorite. I love performing the hits of the '70s more than any kind of music. Those were the impressionable years for me and I think we all fall back to the times we remember from our teenage years. Favorite entertainer to perform with...present or past. JAY: There have been so many, but we all have a special fondness for Andy Williams because of the opportunity he gave us in this business. The Donny and Marie spin-off and its effect to the overall brand name "Osmonds"? JAY: I think of the Osmond name as a company, sort of like General Motors, for instance. They have Buick, Cadillac, etc., under one company. That’s how we looked at our family–different offshoots from the same brand name.